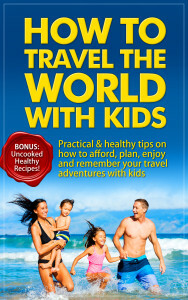 Have you ever dreamt of travelling the World with your kids? Not sure how to make it real, working and enjoyable for all involved? Are you afraid of unknown exotic places, leaving your home for extended period of time? Would you like to learn how to keep yourself and your family healthy during your travels? If your answer are YES, this short guide book might be great for you. We are a family of four, job free by a choice and currently travelling the world, sharing all our practical and healthy tips to inspire others,focusing on natural parenting. – Keep your kids entertained on long-haul journey (by age group).Tips and games. – Remember all adventures and practical tips, games etc. BONUS: 17 uncooked recipes which are gluten, dairy and refined sugar free with pictures.